Don't ask about fuel economy. Just, don't. If you have something you've always wanted to see in a car, but haven't, now is your chance: call up Bentley and have them fit it to your Mulsanne. Just be sure to have your Swiss bank account numbers at the ready. From billionaires to the merely wealthy, the 2013 Bentley Mulsanne provides the luxury, technology, and heritage a discerning buyer wants. The 2013 Bentley Mulsanne is a four-door hyper-luxury sedan with immense power, classic styling seen through a modern lens, painstakingly built with Bentley's own inimitable taste and fastidious attention to detail. With a long, sweeping profile and extended, long-wheelbase cabin, the Mulsanne won't be mistaken for one of the new breed of four-door coupes any time soon, but at the same time, its upright grille, long body, and uniquely Bentley curves ensure it won't be mistaken for anything else, either. Under the hood of the Mulsanne lies a twin-turbocharged 6.75-liter V-8 engine rated at 505 horsepower and 752 pound-feet of torque. The Mulsanne, however, isn't all about power. In fact, that's hardly the point at all—the real story is in the style, the accommodations, and the comfort. And it's a story worth listening to. Each Mulsanne interior takes roughly 170 hours to complete, including the hand-stitched steering wheel, 24 swatches of leather interior from which to choose, a "waistrail" of wood that surrounds the cabin—including an unbroken stretch spanning the dashboard, and wool Wilton-weave mats over lush carpeting. The words "elegant" or "sumptuous" fall far short of accurately describing the interior. Beyond the plush and traditional inside, the Mulsanne sports the latest in audio and entertainment to stay up-to-date with the jet-set clientele that the car is likely to attract. Tunes permeate through a 14-speaker base audio system or an optional 2,200-watt 20-speaker Naim system that's almost better than being there for the first time. Infotainment duties are handled through a high-resolution 8.0-inch touchscreen that hides behind a wood door when not in use. The Mulsanne seamlessly incorporates high technology without being overt about it; it doesn't intrude on the luxury of the vehicle, rather the technology enhances it. Like you might expect from a flagship luxury sedan, the Mulsanne offers an endless list of customizable features including special order interior and exterior colors—the sky is the limit if your pockets are deep enough. 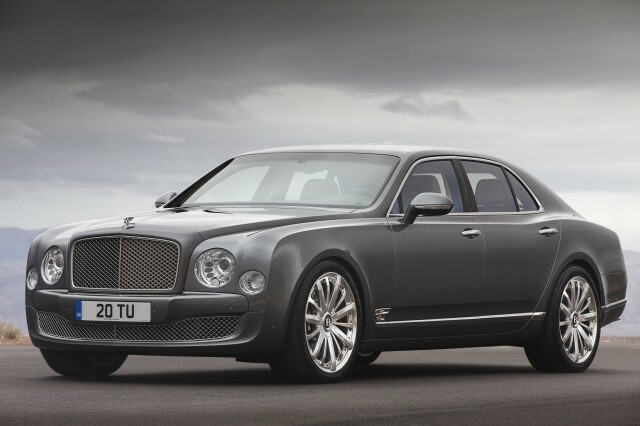 We'd be hard-pressed to turn away a standard Mulsanne either. Last year, Bentley added a Mulliner Driving Specification package that adds ultra-luxury interior elements such as diamond-quilted perforated leather, baseball-stitched leather on the gear selector, and knurled controls inside. For performance, the Mulliner spec adds two-piece 21-inch alloy wheels and a sport setting for the drive select system. Befitting a luxury car of its price, all Mulsannes can be fitted with a sunroof and a champagne cooler between the rear seats, naturally. Considering the Mulsanne's price and exclusivity, neither the NHTSA nor the IIHS have crash-tested the car—and they're not likely to do it anytime soon. The good news? There are 5,700 pounds of steel, wood, and leather standing between you and the elements if it should go pear-shaped—and we hope they don't. Mulsannes include a standard complement of airbags and traction control systems as well.